1 Penn Plaza was built in International Style II by Kahn & Jacobs in 1972. Built of structural steel and concrete, its facade is a curtain wall of steel and gray solar glass punctuated by columns of anodized aluminum. The 57-storey black glass office tower, owned by Vornado Realty, rises to 750 feet, with three setbacks, next to Madison Square Garden. There are entry plazas on the 33th and 34th Street sides, as well as one facing Eighth Avenue, complete with trees and planters and flanked by restaurants and cafés. Due to the windiness of an open plaza, a conventional fountain was out of question, so a "fog fountain" was conceived instead: a high dark stone pyramid that emits water spray in summer and steam in winter. 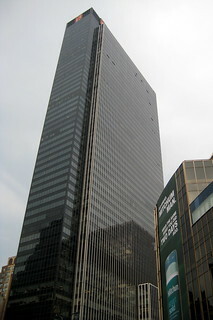 At the top of the building there are four similar red and white neon-light One Penn Plaza logos, each one eight meters high, as immediate identification beacons. The ground floor is leased to several commercial tenants, including a large K-Mart store, and a restaurant.